VascuPro CE – Consensus Medical Systems, Inc. The Ultimate Vascular Lab Reporting Software! VascuPro™ is the gold standard vascular lab reporting software. 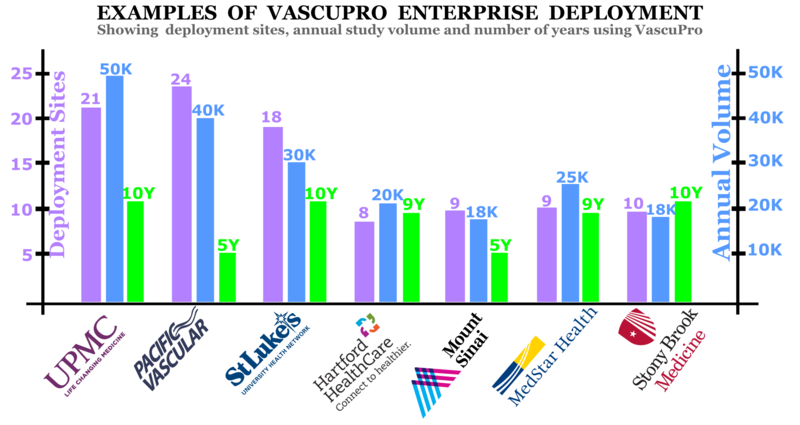 For over 20 years, every day, thousands of non-invasive vascular lab reports are completed on VascuPro™ by the vascular technologists in many prestigious health institutes in North America and Europe. VascuPro™ seamlessly interfaces with imaging and physiologic vascular lab equipment. Study images and measurements are automatically transferred to user defined report to facilitate easy interpretation of study findings. VascuPro™ supports DICOM SR standards and user defined custom measurements. Instant and automatic comparison of study findings with prior studies to monitor disease progress. Provides dynamic documentations of grafts and/or stents in any combinations of different patients. VascuPro™ interfaces with EPIC, Cerner, Meditech, Allscripts and all EMR systems that support HL7 standards. VascuPro™ interfaces with all PACS systems that support DICOM Q/R standards. Integrated interactive study drawings, training module, advanced quality control & IAC accreditation reports, patient follow-up and automatic reminders of late studies. More info? Click on the brochure to see additional features. Contact us to schedule a web demo. The greatest testament of our clients' satisfaction with our products and services is their decision to expand our software deployment to additional sites after their initial experience. Enterprise robustness, complete acquisition of study measurements, seamless integration with multiple EMR/PACS/RIS systems, and highly responsive support services are all key factors that differentiate VascuPro™ and Consensus support services from any other available system on the market.